The same criticisms that were lobbed against «Populorum Progressio» have been made about the Apostolic Exhortation «Evangelii Gaudium» because Pope Francis makes the same points that Pope Paul did. Most controversially, Pope Francis questions Christians who assume that “trickle-down theories” will right existing economic imbalances, and he condemns the “new tyranny” of global finance, institutional corruption and international debt. «Evangelii Gaudium,» 54, 56. These passages have been causing peoples heads to explode, as apparently some Catholic thinkers are not familiar with the social magisterium of the 20th Century Popes. These arguments were not even new when Paul VI made them in 1967. After all, it was 1931 when Pius XI declared that, “not only is wealth concentrated in our times but an immense power and despotic economic dictatorship is consolidated in the hands of a few ... This dictatorship is being most forcibly exercised by those who, since they hold the money and completely control it, control credit also and rule the lending of money.” This “dictatorship,” Pius wrote, “is the fruit that the unlimited freedom of struggle among competitors has of its own nature produced, and which lets only the strongest survive” (i.e., the free market system). «Quadragesimo Anno,» 105, 107. Repeat to yourself: the Pope is not a Marxist. Now, go say three Hail Mary’s. The Pope, by all reports, is very favorably inclined. The Congregation for the Doctrine of the Faith has signed off. The Congregation for the Causes of Saints sees no impediment. The Salvadoran Bishops Conference is unanimously in favor. The current Salvadoran president is very favorably disposed toward Romero. The major candidates for president in 2014, across the political spectrum, are in favor. International and ecumenical support for Romero’s beatification continues to grow. 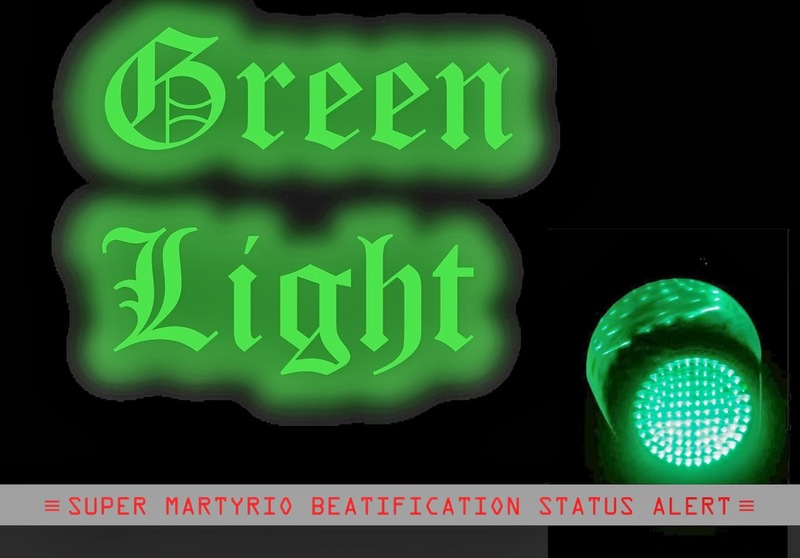 Super Martyrio began tracking Romero’s beatification cause using the color coded system in October 2010, designating the status of the cause under an “amber alert” at the time, to indicate “moderate or slow forward motion.” The “amber” status was maintained until March 2012, when the condition of the beatification process was downgraded to “red:” “Archbishop Romero’s canonization drive is dormant,” we said at the time. 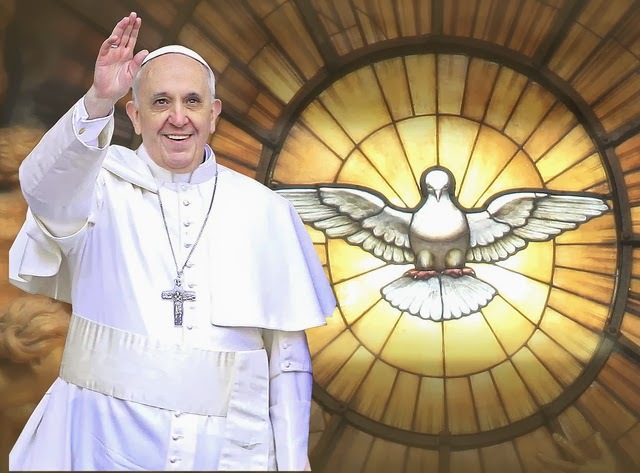 The situation was restored to amber/yellow in May of this year, shortly after the announcement at the end of April that Pope Francis had lifted the hold order over the cause. Shortly after Pope Francis was elected, Msgr. Gregorio Rosa Chávez, the Auxiliary Bishop of San Salvador, commented that the stars appeared to be aligning in favor of Archbishop Romero’s beatification. As far as we can see, the alignment is now complete. El Papa, según todos los informes, está muy favorablemente inclinado. La Congregación para la Doctrina de la Fe ha dado su aval. La Congregación para las Causas de los Santos no tiene inconveniente. La Conferencia Episcopal de El Salvador está a favor de manera unánime. El actual presidente salvadoreño está muy favorablemente dispuesto hacia Romero. Los candidatos a la presidencia en 2014, de todo el espectro político, están a favor. El apoyo internacional y ecuménico a la beatificación de Mons. Romero sigue creciendo. 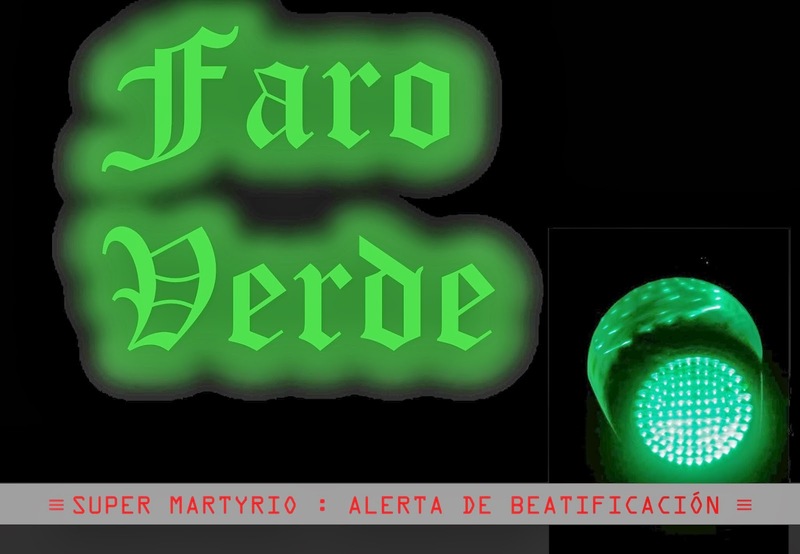 Súper Martyrio comenzó a monitorear la causa de beatificación de Mons. Romero mediante el sistema de alerta de colores en octubre de 2010, cuando se designa el estado de la causa bajo una “alerta amarilla” para indicar un “progreso moderado o lento”. El estado “amarillo” se mantuvo hasta marzo de 2012, cuando el estado del proceso de beatificación fue degradado a “rojo”, cuando dijimos que “el proceso de canonización de Mons. Romero está durmiente”. La situación fue restaurada al amarillo en mayo de este año, poco después del anuncio al final de abril que el Papa Francisco había levantado la orden de retención sobre la causa. Poco después de que el Papa Francisco fue elegido, Mons. Gregorio Rosa Chávez, Obispo Auxiliar de San Salvador, comentó que las estrellas parecían alinearse a favor de la beatificación de Mons. Romero. Por lo que podemos ver, la alineación ahora está completa. Il Papa, da tutti i rapporti, è molto ben disposto. La Congregazione per la Dottrina della Fede ha dato la sua approvazione. La Congregazione per le Cause dei Santi no ha impedimento. La Conferenza episcopale salvadoregna è unanimemente a favore. L’attuale presidente salvadoregno è molto ben disposto verso Romero. I principali candidati a presidente nel 2014, di tutto lo spettro politico, sono a favore. Il sostegno internazionale ed ecumenico per la beatificazione di Romero continua a crescere. Super martyrio ha iniziato il monitoraggio della causa di beatificazione di Romero utilizzando il sistema di colore nel mese di ottobre 2010, cuando abbiamo designato lo stato della causa con un “allarme giallo”, per indicare “progresso moderato o lento”. 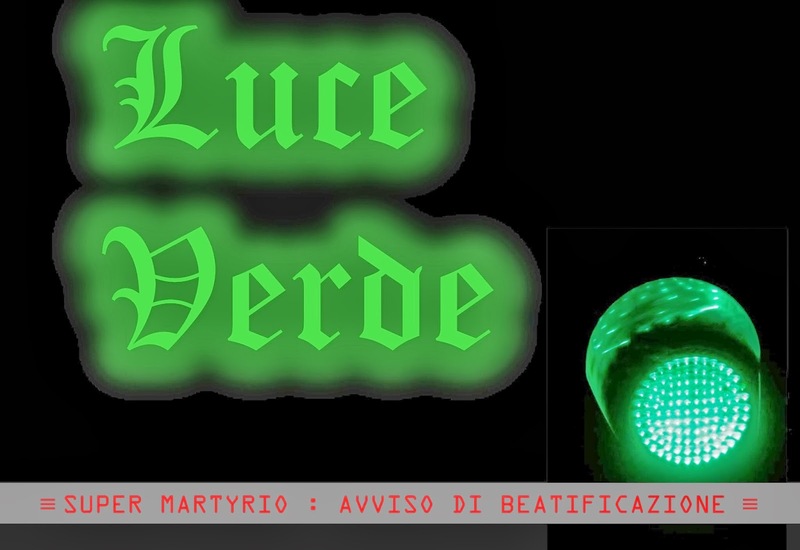 Lo stato giallo è stato mantenuto fino marzo 2012, quando la condizione del processo di beatificazione è stato declassato a “rosso” dicendo che “la causa di canonizzazione di Mons. Romero è dormiente.” La situazione è stata restaurata ad ambra/giallo maggio di quest’anno, poco dopo l’annuncio alla fine di aprile, che Papa Francesco aveva revocato l’ordine di tenere sopra la causa. Poco dopo Papa Francesco è stato eletto, Mons. Gregorio Rosa Chávez, Vescovo Ausiliare di San Salvador, ha commentato che le stelle sembravano allineare a favore della beatificazione di Mons. Romero. Per quanto possiamo vedere, l’allineamento è ora complete. In his first apostolic exhortation, Pope Francis proclaims his hope that we will “recover and deepen our enthusiasm, that 'delightful and comforting joy of evangelizing, even when it is in tears that we must sow,' [a]nd may the world of our time ...receive the good news not from evangelizers who are dejected, discouraged, impatient or anxious, but from ministers of the Gospel whose lives glow with fervour, who have first received the joy of Christ.” [«Evangelii Gaudium,» 10]. Intended to marshal the energies of the ‘New Evangelization,’ the Pope’s text emphasizes the themes that Pope Francis has made well known in his pontificate: evangelization, mission, and social justice. That same description fairly summarizes Archbishop Óscar A. Romero’s fourth and final pastoral letter, released on the Feast of the Transfiguration in August 1979. 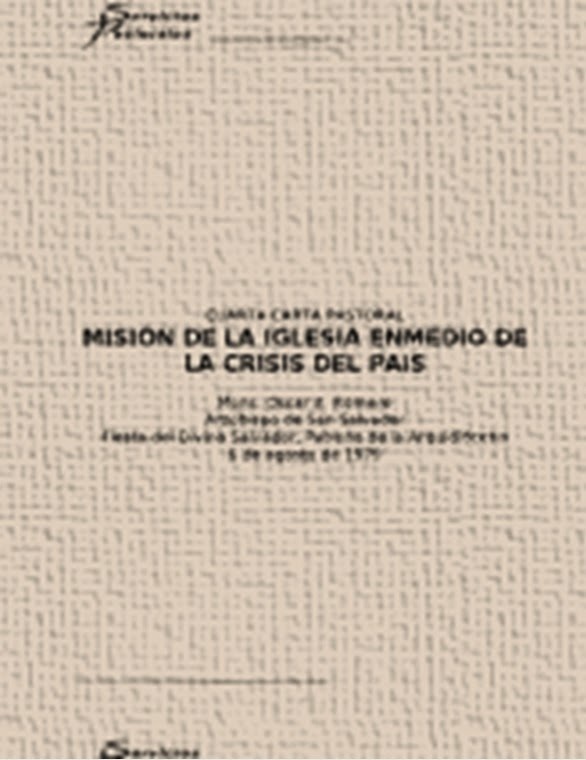 In “The Church’s Mission amid the National Crisis” [Spanish text | English translation], Archbishop Romero posits that the Church’s mission during the Salvadoran political crisis that led to a civil war, required her to renew and intensify her evangelizing activity. You might say that Romero called for a New Evangelization. “In the present social and political conditions of this country,” Romero wrote, “the evangelizing of the Salvadoran people cannot simply continue the tradition of preaching and encouraging en masse, or in a moralizing fashion.” (Compare Pope Francis: “A preaching which [is] moralistic or doctrinaire ... detracts from ... heart-to-heart communication” [«Evangelii Gaudium,» 142.]) Instead, said Romero, the Church’s new evangelization “has to pursue a personalizing education in the faith, one that forms, by means of small groups meeting for reflection, persons who take a critical stance visa-vis the world about them with criteria drawn from the Gospel.” (Francis: the Church must demonstrate her “concern that the Gospel have a real impact on God’s faithful people and the concrete needs of the present time.” [«Evangelii Gaudium,» 95.]) In sum, Romero’s letter sounds the principal themes of Pope Francis, using the word “evangelization” 55 times, and “mission” 43 times. Romero condemns the ‘absolutization’ of certain secular principles that draw people apart by creating artificial social divides. Romero describes and analyzes the different forms of violence that were arising in El Salvador and evaluates them by the standard of the Church’s theory of just war. Romero reminds the faithful that the Church has a fundamental difference of opinion with Marxism about the existence of God, and warns that even casually using Marxist analysis as a reference tool is dangerous, without further authoritative study or guidance from the Church. According to Romero biographer Fr. James Brockman, Romero used his pastoral letter to teach that the Church “must first of all be itself, be true to its own identity as Church.” [Brockman, “Pastoral Teaching of Archbishop Oscar Romero,” Spirituality Today, Summer 1988, Vol.40 No. 2.] The Church, Romero said, “offers only the Gospel, and makes no purely political contribution or one arising from any merely human skill. It preaches the liberating message of the Gospel, God's truth about Christ, about the Church, and about humanity. It denounces sin and error and preaches conversion and the overturning of the idols it finds in society.” Romero warns about the establishment of “absolutes” on both the right and the left of the political spectrum: “In El Salvador the idols were property and national security on one side and, for some on the other side, the popular organization which for activists could become more important than the people it meant to serve.” Romero warned against “the absolutization of wealth and private property,” saying that it was “the cause of a great part of our economic, social, and political underdevelopment.” (Compare Pope Francis: the worsening gap between rich and poor “is the result of ideologies which defend the absolute autonomy of the marketplace and financial speculation” [«Evangelii Gaudium,» 56.]) Importantly, Romero also includes another absolute in his list of offenders: “the absolutization of an organization,” by which he chides the people’s organizations when they became ideological, sectarian, intransigent or fanatical. According to Fr. Brockman, Romero also teaches in his fourth pastoral letter that, “The Church advocates profound and urgent social change, but through nonviolent means.” Romero analyzes the different categories of violence that were arising using straightforward terms, “Structural Violence,” “Arbitrary Violence of the State,” “Violence of the Extreme Right,” and does not hesitate to describe violence from the left as “Terrorist Violence” and “Insurrectional Violence.” After exhausting the categories, “the archbishop of San Salvador reminded the nation that violence was justifiable only in extreme situations when all other alternatives have been exhausted, citing Catholic just war theory.” [Filip Mazurczak, “Oscar Romero’s Exaggerating Critics,” First Things, March 7, 2013.] “This is an opportune moment,” Romero implores, “to recall that celebrated phrase of Pope Pius XII on war: ‘Nothing is lost by peace, everything may be lost in war’.” Finally, Romero warns that pacifism does not mean passivism, and that Christians must remain vigilant about what steps may be required to ensure the establishment of justice. Mission. Evangelization. Social justice. Whether facing a small, third world country slipping into civil war, or the global community facing the challenges of a new millennium, the pastoral touchstones remain constant. Archbishop Romero is in tune with Pope Francis because both share the vision of the Council. En su primera exhortación apostólica, el Papa Francisco proclama su esperanza de que “[r]ecobremos y acrecentemos el fervor, 'la dulce y confortadora alegría de evangelizar, incluso cuando hay que sembrar entre lágrimas' [y] ojalá el mundo actual ... pueda así recibir la Buena Nueva, no a través de evangelizadores tristes y desalentados, impacientes o ansiosos, sino a través de ministros del Evangelio, cuya vida irradia el fervor de quienes han recibido, ante todo en sí mismos, la alegría de Cristo”. [«Evangelii Gaudium», 10 ]. Buscando canalizar las energías de la “Nueva Evangelización”, el texto del Papa hace hincapié en los temas que Francisco ha destacado en su pontificado: la evangelización, la misión y la justicia social. Esa misma descripción se puede aplicar a la cuarta y última carta pastoral de Mons. Óscar A. Romero, publicada para la Fiesta de la Transfiguración, en agosto de 1979. 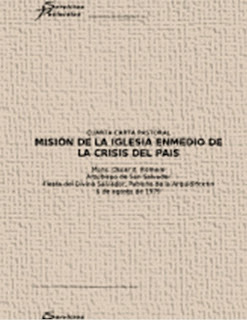 En “La Misión de la Iglesia en Medio de la Crisis del País” [texto en español | traducción al inglés], Mons. Romero plantea que la misión de la Iglesia durante la crisis política de El Salvador que evolucionó hacia una guerra civil, la obligaba a renovar e intensificar su acción evangelizadora. Se podría decir que Romero llamó a una Nueva Evangelización. “La evangelización de este pueblo”, escribió Romero, “en las actuales condiciones sociales y políticas del país, no puede contentarse con continuar la tradición de una predicación y una animación de carácter masivo puramente moralizante”. (Compárese el Papa Francisco: “La predicación puramente moralista o adoctrinadora ... reduce [l]a comunicación entre corazones” [«Evangelii Gaudium», 142.]) Por lo contrario, dijo Romero, la nueva evangelización de la Iglesia “tiene que emprender la educación personalizante de la fe que forme, a través de pequeños grupos de reflexión, hombres críticos de su ambiente con criterios valientes de Evangelio”. (Francisco dice que la Iglesia debe cuidar “que el Evangelio tenga una real inserción en el Pueblo fiel de Dios y en las necesidades concretas de la historia”. [«Evangelii Gaudium», 95.].) Sin duda, la carta de Mons. Romero suena los temas principales del Papa Francisco, usando la palabra " evangelización" 55 veces y "misión" 43 veces. La confluencia de criterios se explica por un vínculo común entre Romero y Francisco: el Concilio Vaticano II. Fue el mandato del Concilio de renovar la evangelización que el Papa Pablo VI trató de definir, cuando dijo: “Conservemos la dulce y confortadora alegría de evangelizar, incluso cuando hay que sembrar entre lágrimas”. [«Evangelii Nuntiandi», 80 ]. Tanto Romero como Francisco se basan en gran medida en la exhortación del Papa Pablo. Romero la cita más que cualquier otro documento papal, sobre todo para la proposición de que la liberación no puede estar divorciada de la trascendencia, y Francisco, ha dicho que «Evangelii Nuntiandi» es “según mi parecer, el documento pastoral más grande escrito hasta nuestros días” (el nombre de la nueva exhortación de Francisco proviene de las palabras de Pablo antes citado, dichas en latín). Tanto Romero como Francisco interpretan «Evangelii Nuntiandi» a través del prisma de los obispos latinoamericanos. En su cuarta carta pastoral, Romero cita a las declaraciones de la conferencia en 1979 de obispos de Puebla 140 veces, y es bien conocido que la carta magna de Francisco es el documento final de la conferencia de 2007 en Aparecida. Con ese conocimiento como guía, la carta de Romero refleja un intento fiel del anuncio gozoso del Evangelio, en las palabras del Papa Pablo “cuando hay que sembrar entre lágrimas”. Romero condena la “absolutización” de ciertos principios seculares que dividen al pueblo, sembrando alienaciones sociales artificiales. Romero describe y analiza las diferentes formas de violencia que estaban surgiendo en El Salvador y las evalúa por el estándar de la teoría de la Iglesia de la guerra justa. Romero recuerda a los fieles que la Iglesia tiene una diferencia fundamental de opinión con el marxismo sobre la existencia de Dios, y advierte de que incluso usar casualmente el análisis marxista como instrumento de referencia es peligroso, sin más estudio autorizado o una orientación por la Iglesia. Según el biógrafo de Romero p. James Brockman, Romero utilizó su carta pastoral para enseñar que la Iglesia “debe en primer lugar ser quien és, ser fiel a su propia identidad como Iglesia”. [Brockman, “Enseñanza Pastoral de Mons. Oscar Romero”, Spirituality Today, Verano 1988, Vol. 40 N º 2.] la Iglesia, dijo Romero, “sólo ofrece el Evangelio, y no hace ninguna contribución puramente política o una que surja de cualquier habilidad meramente humana. Predica el mensaje liberador del Evangelio, la verdad de Dios sobre Cristo, sobre la Iglesia y sobre el hombre. Denuncia el pecado y el error y predica la conversión y la des-entronización de los ídolos que encuentran en la sociedad”. Romero advierte sobre el establecimiento de “absolutos”, tanto a la derecha como a la izquierda del espectro político: “En El Salvador los ídolos eran la propiedad y la seguridad nacional, por un lado y, para algunos en el otro lado, la organización popular, que para los activistas podría llegar a ser más importante que las personas que debería servir”. Romero advirtió contra “la absolutización de la riqueza y la propiedad privada”, diciendo que era “la causante de gran parte de nuestro subdesarrollo económico social y político”. (Compárese el Papa Francisco: la brecha entre ricos y pobres “proviene de ideologías que defienden la autonomía absoluta de los mercados y la especulación financiera” [«Evangelii Gaudium», 56.]). Es importante destacar que Romero también incluye otra absoluta en su lista de delincuentes: “la absolutización de la organización”, por la que reprende a las organizaciones populares cuando llegan a ser ideológicas, sectarias, intransigentes o fanáticas. Según el Padre Brockman, Romero también nos enseña en su cuarta carta pastoral que “la Iglesia aboga por un profundo y urgente un cambio social, pero a través de medios no violentos”. Romero analiza los diferentes tipos de violencia que estaban surgiendo con términos sencillos, “violencia estructural”, “violencia arbitraria del estado”, “violencia de la extrema derecha”, y no dudó en calificar la violencia de la izquierda como “violencia terrorista injusta” y “violencia de la insurrección”. Después de agotar las categorías, “el arzobispo de San Salvador recordó a la nación que la violencia era justificable sólo en situaciones extremas cuando todas las otras alternativas habían sido agotadas, citando la teoría católica de la guerra justa”. [Filip Mazurczak, “Los críticos exagerantes de Oscar Romero”, First Things, 7 de marzo de 2013.] “Es oportuno recordar”, dijo Romero implorando, “la célebre frase del Papa Pío XII ante la conflagración de la guerra: ‘nada se pierde con la paz, todo se puede perder con la guerra’ ”. por último, Romero advierte que el pacifismo no significa pasividad, y que los cristianos deben permanecer alertas sobre las medidas que se puedan requerir para garantizar el establecimiento de la justicia. Romero también entendió que muchos en las organizaciones populares se dejaban llevar por el marxismo y vio la necesidad de opinar sobre la utilidad del análisis marxista. Padre Brockman: “las ideas marxistas eran moneda común en las organizaciones populares, al menos al nivel de liderazgo, y muchas personas en las comunidades cristianas se preguntaban acerca de los posibles usos y peligros del marxismo”. Monseñor Romero: “Naturalmente, si se entiende por marxismo esa ideología materialista y atea, que engloba la existencia del hombre y da una interpretación falsa de la religión, es completamente inadmisible para un cristiano”. Esto se debe a que, para un cristiano su “fe orienta su vida, a partir de la existencia de Dios, hacia una trascendencia espiritual y eterna que se hace posible en Cristo, por el Espíritu Santo”. P. Brockman dice que “Romero hace eco de la advertencia de Pablo VI en la carta apostólica «Octogesima Adveniens» frente a los posibles riesgos de usar” el marxismo “como un análisis estructural del orden económico y social”, pretendiendo ignorar su propaganda atea. “Vio un mayor peligro en el uso marxismo como una estrategia política para la toma del poder, ya que podría dar lugar a conflictos de conciencia acerca de los medios y métodos que pueden ser contrarios a la ética cristiana y que podría dar lugar a un absoluto de organización, como él había ya advertido”. Misión. Evangelización. Justicia social. Ya sea frente a un pequeño país del tercer mundo que cae en una guerra civil o ante la comunidad mundial enfrentando los desafíos de un nuevo milenio, las piedras de toque pastoral son constantes. Monseñor Romero está en sintonía con el Papa Francisco porque ambos comparten la visión del Concilio. Nella sua prima esortazione apostolica, il Papa Francesco proclama la sua speranza che “Recuperiamo e accresciamo il fervore, ‘la dolce e confortante gioia di evangelizzare, anche quando occorre seminare nelle lacrime’ [e] possa il mondo del nostro tempo ... ricevere la Buona Novella non da evangelizzatori tristi e scoraggiati, impazienti e ansiosi, ma da ministri del Vangelo la cui vita irradii fervore, che abbiano per primi ricevuto in loro la gioia del Cristo”. [«Evangelii Gaudium», 10]. Con l'obiettivo di schierare le energie della ‘nuova evangelizzazione’, il testo sottolinea i temi che il Papa Francesco ha fatto ben noto nel suo pontificato: evangelizzazione, missione, e giustizia sociale. Quella stessa descrizione riassume bene la quarta e ultima lettera pastorale di Mons. Oscar A. Romero, pubblicata nella festa della Trasfigurazione nel agosto 1979. In “La Missione della Chiesa nel Mezzo della Crisi del Paese” [testo in lingua spagnola | traduzione inglese], Mons. Romero postula che la missione della Chiesa durante la crisi politica salvadoregno che ha portato a una guerra civile, ha richiesto di rinnovare e intensificare la sua azione evangelizzatrice. Si potrebbe dire che Romero ha chiamato per una nuova evangelizzazione. “Nelle attuali condizioni sociali e politiche di questo paese”, ha scritto Romero, “l’evangelizzazione del popolo salvadoregno non può semplicemente continuare la tradizione della predicazione e incoraggiamento in massa, o in un modo moralizzante”. (Confronta Papa Francesco: “La predicazione puramente moralista o indottrinante ... riducono questa comunicazione tra i cuori” [«Evangelii Gaudium», 142. ]), invece, ha detto Romero, la nuova evangelizzazione della Chiesa “deve cercare una formazione personale in la fede, per insegnare, per mezzo di piccoli gruppi riuniti per la riflessione, persone che prendono criteri critici per confrontare il mondo che li circonda con valori tratte dal Vangelo”. (Francis: la Chiesa deve dimostrare la sua preoccupazione per “il reale inserimento del Vangelo nel Popolo di Dio e nei bisogni concreti della storia” [«Evangelii Gaudium», 95]). In sintesi, la lettera di Romero suona i temi principali di Papa Francesco, usando la parola “evangelizzazione” 55 volte, e “missione” 43 volte. La confluenza di criteri si spiega con il legame comune tra Romero e Francesco: il Concilio Vaticano II. Fu questo mandato del Consiglio di evangelizzare di nuovo che il Papa Paolo VI ha cercato di definire, quando disse: “Conserviamo la dolce e confortante gioia d'evangelizzare, anche quando occorre seminare nelle lacrime” [«Evangelii Nuntiandi», 80]. Entrambi Romero e Francesco attingono abbastanza la esortazione del Papa Montini. Romero cita «Evangelii Nuntiandi» più di ogni altro documento pontificio, soprattutto per la proposizione che la liberazione non può essere separata dalla trascendenza, e Francesco ha detto che «Evangelii Nuntiandi» è “per me il documento pastorale più grande che è stato scritto fino a oggi” (il nome della nuova esortazione di Francesco viene dal linguaggio di Paolo citato sopra, come reso in latino). Entrambi Romero e Francesco interpretano «Evangelii Nuntiandi» attraverso il prisma dei vescovi latino-americani. Nella sua quarta lettera pastorale, Romero cita le dichiarazioni dei vescovi alla conferenza di Puebla 1979 l’incredibile cifra di 140 volte, ed è ben noto che la Magna Carta Francesco è il documento finale della conferenza di Aparecida nel 2007. Con questa conoscenza come guida, la lettera di Romero riflette il lieto annuncio del Vangelo, secondo le parole di Paolo VI, “anche quando occorre seminare nelle lacrime”. Romero condanna la “assolutizzazione” di alcuni principi secolari che separano la gente con la creazione di divisioni sociali artificiali. Romero descrive e analizza le diverse forme di violenza che sono stati sorgendo in El Salvador e li valuta dallo standard della teoria della Chiesa di guerra giusta. Romero ricorda ai fedeli che la Chiesa ha una fondamentale differenza di opinione con il marxismo circa l’esistenza di Dio, e avverte che utilizzare, anche casualmente, l’analisi marxista come strumento di riferimento è pericoloso, senza ulteriore autorevole studio o guida dalla Chiesa. Secondo il biografo di Romero p. James Brockman, Romero ha usato la sua lettera pastorale per insegnare che la Chiesa “deve prima di tutto essere se stessa, essere fedele alla sua propria identità di Chiesa”. [Brockman, “Insegnamenti pastorali di Mons. Oscar Romero”, Spirituality Today, estate 1988, vol. 40 n ° 2]. La Chiesa, ha detto Romero, “offre solo il Vangelo, e non fa alcun contributo puramente politico o derivante da qualsiasi abilità meramente umana. Si predica il messaggio liberante del Vangelo, della verità di Dio su Cristo, sulla Chiesa e sull’umanità. Denuncia il peccato e l’errore e predica conversione e il rovesciamento degli idoli che trova nella società”. Romero mette in guardia contro la creazione di “assoluti”, sia di destra di sinistra dello spettro politico: “In El Salvador idoli erano la proprietà e la sicurezza nazionale da un lato e, per qualche dall’altro lato, l’organizzazione popolare che per gli attivisti potrebbe diventare più importante di quanto la gente che avrebbero dovuto servire”. Romero critica “l’assolutizzazione della ricchezza e della proprietà privata”, dicendo che era “la causa di una grande parte del nostro sottosviluppo economico, sociale e politico”. (Confronta Papa Francesco: il divario tra ricchi e poveri “procede da ideologie che difendono l’autonomia assoluta dei mercati e la speculazione finanziaria” [«Evangelii Gaudium», 56]). È importante sottolineare che, Romero comprende anche un altro assoluto nella sua lista dei delinquenti: “l’assolutizzazione di una organizzazione”, con la quale rimprovera le organizzazioni popolari quando diventavano ideologiche, settarie, intransigenti, o fanatiche. Secondo p. Brockman, Romero anche insegna nella sua quarta lettera pastorale che, “La Chiesa invoca profonda e urgente cambiamento sociale, ma attraverso mezzi non violenti”. Romero analizza le diverse categorie di violenza che sono stati sorgendo usando termini semplici: “violenza strutturale”, “violenza arbitraria dello Stato”, “violenza di estrema destra”, e non esita a descrivere la violenza da sinistra come “violenza terroristica” e “violenza insurrezionale”. Dopo aver esaurito le categorie, “l’arcivescovo di San Salvador ha ricordato la nazione che la violenza era giustificabile solo in situazioni estreme, quando tutte le altre alternative sono state esaurite, citando la teoria cattolica della guerra giusta”. [Filip Mazurczak, “I critici esagerati di Oscar Romero”, First Things, 7 marzo 2013.] “Questo è un momento opportuno”, Romero implora, “per ricordare quella celebre frase di Papa Pio XII sulla guerra: ‘Nulla è perduto con la pace. Tutto può esserlo con la guerra.” Infine, Romero avverte che il pacifismo non significa passivismo, e che i cristiani devono restare vigili su ciò che passaggi possono essere necessari per assicurare l’instaurazione della giustizia. Romero anche capito che molti nelle organizzazioni popolari sono stati influenzati per il marxismo e vide la necessità di opinare sull’utilità dell’analisi marxista. Padre Brockman: “idee marxiste erano moneta corrente nelle organizzazioni popolari, almeno a livello di leadership, e molte persone nelle comunità cristiane chiesti circa i possibili usi e pericoli del marxismo”. Mons. Romero: "Naturalmente, se si capisce marxismo come una ideologia materialista, atea che viene assunto per spiegare l’ intera esistenza umana e dà una falsa interpretazione della religione, allora è del tutto insostenibile per un cristiano”. Questo è perché, “la fede di un cristiano deve guidare tutta la sua vita, a partire dal l’esistenza di Dio, verso una trascendenza spirituale ed eterna resa possibile in Cristo per mezzo dello Spirito Santo”. P. Brockman dice che “Romero ha fatto eco il monito di Paolo VI nella lettera apostolica «Octogesima adveniens» contro i possibili rischi di usare” il marxismo “come l’analisi strutturale di ordine economico e sociale”, facendo finta di ignorare la sua propaganda ateistica. “Vide un pericolo maggiore nell’utilizzo marxismo come una strategia politica per la presa del potere, perché potrebbe portare a conflitti di coscienza su mezzi e metodi che potrebbero essere in contrasto con l’etica cristiana e potrebbe portare a rendere l’organizzazione un assoluto, come lui aveva avvertito”. Mission. Evangelizzazione. Giustizia sociale. Di fronte a un piccolo paese del terzo mondo scivolare in una guerra civile, e con la comunità globale di fronte alle sfide di un nuovo millennio, le pietre di paragone pastorali rimangono costanti. Mons. Romero è in sintonia con il Papa Francesco, perché entrambi condividono la visione del Consiglio. 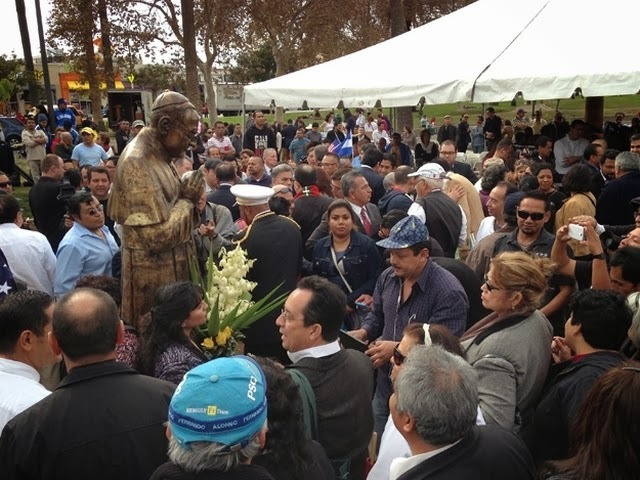 Óscar Romero statue unveiled in L.A.
Gómez said in a statement that “Archbishop Romero filled the hearts of Salvadorans with faith and strength. He reminded us that real peace is based on justice. More than 30 years later, his testimony inspires all of us to build a better world, a world that promotes human dignity and the common good for the human family.” As the leader of the most populous diocese in the United States, Archbishop Gómez is a leading figure of the U.S. Church and the most prominent Latino in the U.S. hierarchy. He was ordained as a priest in Opus Dei. Carlos Vaquerano, a leader of the local Salvadoran community responsible for erecting the monument told the Spanish language newspaper La Opinión that Archbishop Romero’s beatification process “exemplifies his work. He was a man of faith, he was not a politician,” said Vaquerano. 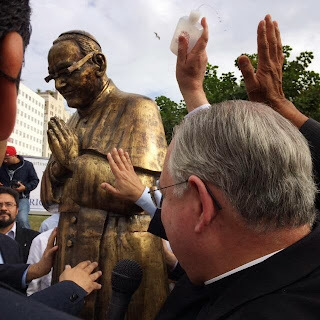 Archbishop Romero is also being memorialized in his native country, where Salvadoran President Mauricio Funes announced that he will rename the state room in the presidential manor to honor Romero. The designation would be the latest in a string of honors for Romero launched by the Funes government, the most prominent of which have been the naming of a central highway artery after Romero, the creation of a “Romero tour,” and the dedication of a mural of Romero at the international airport. There are also efforts underway to erect a Romero statue in a park in Rome. El arzobispo de Los Ángeles José H. Gómez y el alcalde Eric Garcetti estaban entre los dignatarios presentes para la inauguración de una estatua del asesinado arzobispo Óscar A. Romero de El Salvador en el Parque McCarthur de Los Ángeles el sábado 23 de noviembre del 2013. “Estoy bendiciendo un nuevo monumento al gran mártir, Mons. Óscar Romero”, había twitteado Gómez a sus 10.000 seguidores antes de la ceremonia. En el momento culminante de la inauguración, que contó con discursos de políticos locales, el Arzobispo Gómez roció agua bendita sobre la estatua de bronce de dos metros de altura, de Romero rezando ante una gran multitud la mañana del sábado (foto). El alcalde Garcetti dijo a la multitud: “Esto es más que un monumento de un hombre. Este es un monumento que rinde homenaje a la valentía”. Gómez dijo en un comunicado que “Monseñor Romero llenó los corazones del pueblo salvadoreño con esperanza y fortaleza. Él nos recordó que la verdadera paz está basada en la justicia. Más de 30 años después, su testimonio nos inspira a todos nosotros a construir un mundo mejor, un mundo que promueva la dignidad humana y el bien común de la familia humana”. Como líder de la diócesis más numerosa de los Estados Unidos, el arzobispo Gómez es una figura destacada de la Iglesia de EE.UU. y el más prominente hispano en la jerarquía norteamericana. Fue ordenado como sacerdote en el Opus Dei. Carlos Vaquerano, un líder de la comunidad salvadoreña local responsable de erigir el monumento dijo al diario en lengua española La Opinión que proceso de beatificación de monseñor Romero “ejemplifica lo que él ha hecho. Él fue un hombre de fe, no fue un político”, dijo Vaquerano. Monseñor Romero también está siendo conmemorado en su país natal, donde el presidente salvadoreño Mauricio Funes anunció que va a cambiar el nombre del salón de honor en la mansión presidencial en honor a Romero. La designación sería la última en una serie de honores para Romero lanzados por el gobierno de Funes, los más prominentes de los cuales han sido el nombramiento de una arteria de tránsito en honor a Romero, la creación de un “City Tour Romero”, y la dedicación de un mural de Romero en el aeropuerto internacional. También hay esfuerzos en marcha para erigir una estatua de Mons. Romero en un parque de Roma.